Tatra is a Czech vehicle manufacturer in Kopřivnice. It is owned by the Tatra Trucks company, based in Ostrava, and is the second oldest company in the world producing cars with an unbroken history, surpassed only by French automaker Peugeot. The company was founded in 1850 as Ignatz Schustala & Comp., in 1890 renamed Nesselsdorfer Wagenbau-Fabriksgesellschaft when it became a wagon and carriage manufacturer. In 1897, Tatra produced the first motor car in central Europe, the Präsident automobile. In 1918, it changed its name to Kopřivnická vozovka a.s., and in 1919 changed from the Nesselsdorfer marque to the Tatra badge, named after the nearby Tatra Mountains on the Czechoslovak-Polish border (now on the Slovak-Polish border). During World War II Tatra was instrumental in the production of trucks and tank engines for the German war effort. Production of passenger cars ceased in 1999, but the company still produces a range of primarily all-wheel-drive trucks, from 4×4 to 18x18. The brand is also known as a result of Czech truck racer Karel Loprais: in 1988–2001 he won the off-road race Dakar Rally six times with a Tatra 815. 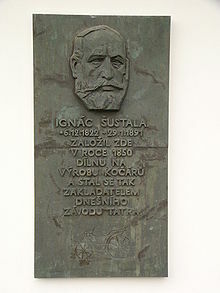 Ignác Šustala (1822–1891), founder of the company "Ignatz Schustala & Comp" in Kopřivnice, Moravia, started the production of horse-drawn vehicles in 1850. In 1891 it branched out into railroad car manufacture, naming the company "Nesselsdorfer Wagenbau-Fabriksgesellschaft", and employed Hugo Fischer von Roeslerstamm as technical director in 1890. After the death of Šustala, von Roeslerstamm took over running the company and in 1897 he bought a Benz automobile. 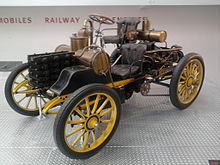 Using this for inspiration, the company made its first car, the Präsident, under the direction of engineers Hans Ledwinka and Edmund Rumpler, which was exhibited in 1897 in Vienna. Orders were obtained for more cars, and until 1900, nine improved cars based on Präsident were made. In 1921 the company was renamed to "Kopřivnická vozovka", and in 1919 the name Tatra was given to the car range. Leopold Pasching took over control and in 1921 Hans Ledwinka returned again to develop the revolutionary Tatra 11. The new car, launched in 1923 featured a rigid backbone tube with swinging semi-axles at the rear giving independent suspension. The engine, front-mounted, was an air-cooled two-cylinder unit of 1056 cc. In 1924 the company was renamed to "Závody Tatra". 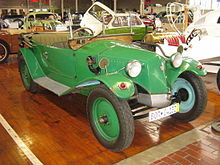 The Tatra 11 was replaced in 1926 by the similar Tatra 12 which had four-wheel brakes. A further development was the 1926 Tatra 17 with a 1,930 cc water-cooled six-cylinder engine and fully independent suspension. In 1927 the company was renamed "Ringhoffer-Tatra". Tatra's specialty was luxury cars of a technically advanced nature, going from air-cooled flat-twins to fours and sixes, culminating (briefly) with the OHC 6-litre V12 in 1931. In the 1930s, under the supervision of Austrian engineer Hans Ledwinka, his son Erich and German engineer Erich Übelacker, and protected by high tariffs and absence of foreign assemblers, Tatra began building advanced, streamlined cars after obtaining licences from Paul Jaray, which started in 1934 with the large Tatra 77, the world's first production aerodynamic car. The average drag coefficient of a 1:5 model of the fastback Tatra 77 was recorded as 0.2455. It featured (as did almost all subsequent big Tatras) a rear-mounted, air-cooled V8 engine, which was in technical terms very sophisticated for the time. Both Adolf Hitler and Ferdinand Porsche were influenced by the Tatras. Hitler was a keen automotive enthusiast, and had ridden in Tatras during political tours of Czechoslovakia. He had also dined numerous times with Ledwinka. After one of these dinners Hitler remarked to Porsche, "This is the car for my roads". From 1933 onwards, Ledwinka and Porsche met regularly to discuss their designs, and Porsche admitted "Well, sometimes I looked over his shoulder and sometimes he looked over mine" while designing the Volkswagen. There is no doubt that the Beetle bore a striking resemblance to the Tatras, particularly the Tatra V570. The Tatra 97 of 1936 had a rear-located, rear-wheel drive, air-cooled four-cylinder boxer engine accommodating four passengers and providing luggage storage under the front bonnet and behind the rear seat. Another similarity between this Tatra and the Beetle is the central structural tunnel. Tatra launched a lawsuit against VW, but this was stopped when Germany invaded Czechoslovakia. At the same time, Tatra was forced to stop producing the T97. 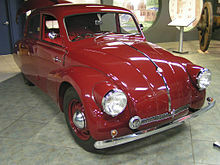 The matter was re-opened after World War II and in 1965 Volkswagen paid Tatra 1,000,000 DM in an out of court settlement. After the 1938 invasion of Czechoslovakia by Nazi Germany, Tatras were kept in production, largely because Germans liked the cars. Many German officers died in car accidents caused by driving the heavy, rear-engined Tatras faster around corners than they could handle. At the time, as an anecdote, Tatra became known as the 'Czech Secret Weapon' for the scores of officers who died behind the wheel; at one point official orders were issued forbidding German officers from driving Tatras. The factory was nationalised in 1945 almost three years before the Communist Party came to power and in January 1946 was renamed to "Tatra Národní Podnik". Although production of prewar models continued, a new model, the Tatra 600 Tatraplan was designed—the name celebrating the new Communist planned economy and the aeroplane inspiration (Colloq. 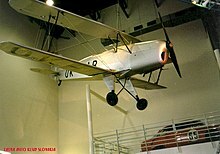 Czech: aeroplán). It went into production in 1948. In 1951, the state planning department decided that the Tatraplan should henceforth be built at the Škoda plant in Mladá Boleslav, leaving Tatra free to concentrate on trucks, buses and railway equipment. In 1953, amid much dissatisfaction among Communist party leaders with the poor-quality official cars imported from Russia, Tatra was again given permission to produce a luxury car, the Tatra 603. Much like Tatra's prewar cars, it was driven by a rear-mounted, air-cooled V8 and had the company's trademark aerodynamic styling. The Tatra 603 initially featured three headlights and the first prototypes had a central rear stabilising fin, though this feature was lost on production vehicles. It was also fitted with almost American-style thick chrome bumpers with bullets (a.k.a. Dagmar bumpers). Almost entirely hand-built, Tatras were not available for normal citizens as they were not permitted to buy them. The cars were reserved for the Communist Party elite, industrial officials, as well as being exported to most other communist nations as official state cars. Notably, Cuban President Fidel Castro had a white Tatra 603, custom-fitted with air conditioning. Tatra 603s were built until 1975, a twenty-year reign as one of Communism's finest cars. Numerous improvements were made during its production run, although not all vehicles built were actually new but rather reconditioned. In exchange for a newer model year car, the older vehicle was returned to the factory. There, it was upgraded to current model year specifications, refinished, and sent out again as a putatively new vehicle to replace another older T603. This makes it difficult to trace the history of surviving vehicles. In 1968 a replacement was developed; the Tatra 613. It was styled by the Italian styling house of Vignale and was a more modern, less rounded shape. It was not until 1973 that the car went into production, and volume production did not begin until the following year. Although the layout remained the same, the body was all new, as was the engine, being equipped with four overhead camshafts, a higher capacity motor (3495 cc) and an output close to 165 bhp (123 kW; 167 PS). In addition, it had been moved somewhat forward for improved balance. These cars were built in five series and went through several modifications until production ceased in 1996. It is a tribute to Vignale's styling that they did not look dated until rather late in that time period. Over 11,000 cars were built, and sales slowed to a trickle of just a few dozen per year towards the end of production as Tatras began to seem more and more outdated. 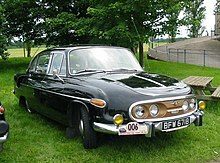 The Tatra 700 was a large luxury car released in 1996 by Tatra. Essentially a heavily restyled version of the Tatra 613 model it replaced, with updated body panels and detailing. The T700 was offered as both a saloon and coupé with either a 3.5 or 4.4 litre 90° air-cooled V8 petrol engine. The model was neither successful nor produced in large numbers, having produced a total of 69-72 cars. The T700 was the last passenger car made by Tatra with production halting in 1999. At this point, Tatra abandoned automobile manufacturing in order to concentrate on truck design and manufacture. The Tatra MTX V8 was the fastest Czech car of all time. Production started in 1991 in Kopřivnice. It has a Tatra 623 V8 engine with inlet manifold injection producing 225 kW at 6500 rpm. It accelerates from 0–100 km/h (62 mph) in 5.6 seconds. The top speed is 265 kilometres per hour (165 mph). The Czech designer Václav Král designed this vehicle, with only 5 units of this car ever produced. In February 2008, Tatra announced the world's first and only air-cooled engine meeting the then forthcoming Euro 5 emissions standards. The press release claims 7.5 times lower emissions of particulates and 3.5 times lower emission of nitrogen oxides compared to the previous engine. Further, production of air-cooled engines should significantly reduce the production of greenhouse gases due to the absence of liquid cooling systems. All Tatra vehicles from February 2008 onwards should use the new engine. A month later, Tatra CEO Ronald Adams told The Prague Post Tatra could return to producing passenger cars, saying: 'We would not come back to compete with the large automobile mass producers such as Volkswagen, Škoda, Toyota etc. But we might come back with a replica of the old Tatra cars using a current undercarriage and driveline from one of the major automotive producers.' The company has launched a feasibility study, hoping to produce one thousand replicas of their legendary Tatraplan and 603 cars in 2010. Unlike most Soviet Bloc manufacturers, Tatra enjoyed modest sales success in Western Europe, where its truck line had a reputation for simplicity and durability. No effort was made to distribute Tatra's unusual automobiles in the West, though a small number did find their way to collectors in Western Europe, and even to the United States. The fall of the Soviet Union did not help Tatra's fortunes, as the company made no inroads in Western Europe's already crowded automobile market. Worse, the introduction of competitors, such as Mercedes-Benz and Peugeot into the Czech Republic, further eroded Tatra's sales. Production of the passenger cars ended in 1999. Among western collectors, Tatra automobiles remain largely unknown. The largest display of Tatra vehicles in the United States is at the Lane Motor Museum in Nashville, Tennessee. The museum's eclectic automobile collection contains 12 Tatra models, including a T-613 ambulance. When talk show host and car collector Jay Leno visited the museum, the founder picked him up in a 1947 Tatra 87, prompting Leno to purchase one himself. Leno soon became an advocate for the brand. In the United States, the few Tatra clubs are closely associated with Citroën clubs, as many Tatra collectors also collect Citroën DS series cars. A Tatra 87 is on exhibit at the Minneapolis Institute of Arts. The first truck manufactured at Kopřivnice in 1898 was a flatbed with 2 liquid-cooled side-by-side-mounted two-cylinder Benz engines each at 2.7 L capacity with total power output of 8.8 kW (12 hp) placed after the rear axle and cargo capacity of 2.5 ton. The unique feature of the engines setup was that the engines could be operated sequentially depending on the load requirements. No 1 engine was started via a cranking handle and had a flywheel attached and No 2 engine without the flywheel was connected via a gear clutch and started by the first engine already running. The second truck manufactured was once again a flatbed R type of 2.5 ton cargo capacity built in 1909. Powered by liquid-cooled petrol four-cylinder engine of 4.1 L capacity and power output of 18.4 kW (25 hp) with the engine placed above front axle which is the conventional design to this day. The vehicle featured solid rubber tyres and semi-elliptic leaf spring suspension. In 1910 Tatra manufactured its first bus the Omnibus type SO with total production of 5 units. The first true serial truck production at Tatra was instigated by the beginning of World War I. In the year 1914 there were only two trucks made, type T 14/40 HP; however by 1915's end the production jumped to a total of 105 TL-2 units, and the following year, 1916, the numbers rose to a total of 196 TL-2 and 30 TL-4. Production peaked in 1917 with 19 TL-2 and 303 TL-4 models, but then production declined, and a similar number of vehicles of one type manufactured in a year was not achieved or surpassed until 1936 with the T 27 model. Technically models TL-2 and TL-4 were almost identically designed; in fact TL-4 evolved from TL-2 where both had liquid-cooled OHC engines of max power output of 25.7 kW (35 PS; 34 hp). The TL-2 had a GVM 2,100 kg (4,630 lb) and 4,000 kg (8,818 lb) GCM, TL-4 had 2,700 kg (5,952 lb) GVM and 6,700 kg (14,771 lb) GCM respectively. Both types remained in production in small series until 1927. The TL-4 is considered the first truck to come out of NW (Nesselsdorfer Wagen-bau) to carry the name Tatra in 1919. After the introduction of Tatra 11 and Tatra 12 cars with their distinctive backbone tube design and swing axles, Tatra introduced its first truck on the same basis, the light utility Tatra 13 powered by 2-cylinder air-cooled petrol engine with power output 8.8 kW (12 hp) and 1,000 kg (2,205 lb) cargo capacity. Further models followed, and in 1926, T23 and T24 were introduced, nicknamed "bulldogs", which could be considered Tatra's precursors to COE designed trucks. Improved version T13 was introduced as T26 with a more powerful 4-cylinder flat air-cooled engine and in six-wheeler chassis created capable offroad light utility truck which later evolved into T72 model which was heavily used by Czechoslovakian army at the time and was also manufactured under license by the French company Lorraine-Dietrich. In 1933 Tatra built a limited series of T25 heavy artillery hauler with 4 and 6-cylinder petrol engines. The most popular Tatra truck before World War II was type T27 powered by 4-cylinder petrol or diesel engines, which remained in production for nearly 17 years (1930–1947) with total production of 7,620 units, by adding an extra axle to the rear the type T28 was created however, it was not successful and only limited production resulted in a mainly bus chassis. In the period from 1931 to 1938 Tatra also built a small utility truck based on the chassis from T30 named Tatra T43 which remain popular with small business owners. T72 model successfully continued the line to T82 built mainly for military in cargo and personnel transport between 1935 and 1938 and further to T92 and T93 built for the Romanian army from 1938 to 1941 which were identical except T93 had also a driven front axle. Following the Nazi occupation of Czechoslovakia the production at Kopřivnice was annexed by the Germans for the supply of trucks needed by the Wehrmacht. Apart from the existing line up of T27, T92/92 a new heavy truck the T81 commenced production featuring liquid-cooled 12.5 L V8 diesel engine with a power output of 118 kW (160 PS; 158 hp), in 6×4 axle configuration. This vehicle evolved in 1942 into the legendary T111 which continued in production until 1962, with the total of 33,690 units made. The T111 also featured Tatra's first air-cooled diesel engine, a massive V12 originally designed for the armoured Sd.Kfz. 234 Puma. In the latter stages of World War II Tatra was instrumental in the development of air-cooled diesel engines for German tanks. In late 1944 General Heinz Guderian ordered that production of the Type 38(t) Hetzer tank be modified to incorporate a Tatra Type 928 V-8 air-cooled diesel engine, though this order was delayed so production could continue uninterrupted. After the war the T111 contributed heavily to the rebuilding effort in Central and Eastern Europe and a memorial was built at Magadan, Siberia for its exploits in the Far East of the USSR. The decision to replace the reliable but ageing T111 was taken in 1952 based on central planning economy of socialist government where directive was made to Tatra N.P. that it should concentrate on the manufacture of 7 to 10 ton capacity commercial vehicles and in 1956 first T137 and T138 trucks were exhibited at the Czechoslovak machinery expo in Brno. Production of the T111 continued alongside the T138 series until 1962. The T138 itself continued in production until 1969 when it was replaced by the improved T148, which provided an increase in power output, reliability and product improvements. The Tatra 815 was designed for extreme off-road conditions, and its road versions are derived from the off-road original. After the 53-rd session of CMEA council a directive that Tatra N.P. would be a sole supplier of off road commercial vehicles of <12 ton capacity for Eastern Block countries, led to a modernization of the company and its production models. Following extensive testing at different sites, including Siberia, the type T815 was introduced in 1982 and production started in 1983. The T815 was made of 142 main assembly components as opposed to the 219 main assembly components of its predecessor. The engine's power output was increased up to 45% and a new COE tiltable cabin was introduced. Modular engine design resulted in V8, V10 and V12 engines with or without turbocharger. T815 was upgraded to T815-2 with minor cosmetic changes and improved ergonomics and safety - the biggest change was the engine emissions accordance with the "Euro0" limits and to Euro 1 limits in 1993 (turbocharged V8 engine only since this time for the full legislation. As alternative was offered also the Deutz 513 air-cooled V8 engine). The next facelift in 1997 brought in the new exterior design cabin TerrNo1 with all new interior with better sound and heat insulation however the cabin design is based on the original so it can actually be retrofitted to all T815 built since 1993. In 2000 the TerrNo1 cabin is face-lifted again and for the first time there is an option to fit liquid-cooled engines. The evolution of Tatra 815 would not be complete without mentioning its derivates T816 (T815-6) Armax and Force series which had its origin back in 1993 when Tatra participated in the tender process for heavy duty off road trucks for UAE army and after two years of bidding the company was successful in securing a contract worth $180 million. The resulting model became known as T816 "LIWA" (Arabic for "desert"). The latest model for the military customers is T817(T815-7) marketed as high-mobility heavy-duty tactical truck with low profile cabin for C-130 Hercules transportability for NATO member countries armed services. 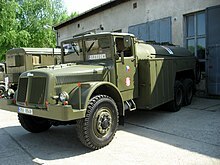 Tatra was also a successful bidder for the Czech Army replacement of aging Praga V3S (with the Tatra I6 air-cooled engine – one half of the T111 V12 one) medium off-road truck with T810 which technically is not a "genuine" Tatra as its origin goes back to when former Czech company ROSS, in partnership with Renault Trucks, obtained a contract to supply the army with medium size off-road trucks, the "ROSS R210 6×6". 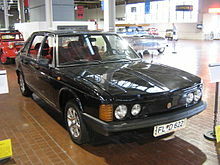 The company however went bankrupt in 1998 and Tatra bought full rights to the design, then modernized and reintroduced it as T810 while continuing cooperation with Renault. Under the deal Renault supplies the cabins and the engines and Praga supplied axles and transmissions for the prototypes; however, the whole project has been dogged by controversy due to the way Tatra had obtained the contract, its relationship with supplier Praga and the subsequent court case brought against it by Praga. The serial T810 vehicles are equipped with the new design Tatra rigid axles with the WABCO disc brakes, with the ZF Ecolite transmission and Steyr drop box. Tatra and Navistar Defence introduced at Eurosatory Exposition in Paris, France (Jun 14-18 2010) the results of their strategic alliance since October 2009, the models ATX6 (universal container carrier) and ATX8 (troop carrier). The vehicles appear to be based on Tatra 815-7 (T817) 6×6, 8×8 chassis, suspension and cabins while using Navistar engines and other components. Under the deal Navistar Defence and Tatra A.S. will market the vehicles in North America, which includes sales to the United States military and foreign military sales financed by the United States government. Tatra will source parts and components through Navistar’s global parts and support network for Tatra trucks delivered in markets outside of North America as well as market Navistar-Tatra vehicles around the world in their primary markets. The Terex Corporation, an American company, acquired the majority ownership (71%) of Tatra in late 2003. As of late 2006, however, majority ownership (80.51%) was in the hands of Tatra Holdings s.r.o., an international consortium comprising Vectra Limited of UK, Sam Eyde of the U.S., KBC Private Equity of Belgium, Meadowhill s.r.o. of Czech Republic and Ronald Adams of the U.S. On 15 December 2006, a contract was signed between Tatra and the Czech Republic for 556 trucks at roughly $130 million, or 2.6 billion Czech crowns. This contract was signed in lieu of replacement of older military vehicles. In March 2013, Tatra was sold in auction for 176 mil CZK (c. 7 mil euro) due to its debts to Truck Development company (renamed to Tatra Trucks) based in Ostrava, Czech Republic. Production continues. In 2013 Tatra sold 722 trucks, the most since 2008. Approximately two-thirds of units were exported. In 2016, Tatra increased production by 56% and sold 1326 vehicles, all produced vehicles were sold. 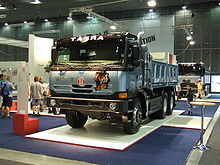 Tatra had a truck-building joint venture in India called Tatra Vectra Motors Ltd, formerly called Tatra Trucks India Ltd. It is a joint venture between Tatra and the Vectra Group from England. In 2009, Vectra announced a new joint venture with Russia's Kamaz to form Kamaz Vectra Motors Limited to manufacture Kamaz trucks in India., This joint venture replaced the former Tatra Vectra venture. The manufacturing plant is located in Hosur, Tamil Nadu. The fully integrated manufacturing facility includes an engine assembly and testing plant, a cabin welding shop, a frame fabrication shop and a test track. Most Tatra trucks for sale in India are manufactured in collaboration with Bharat Earth Movers Limited. In 2002, the company received a 1,070 trucks order from the Government of India. Tatra's growing involvement in India's defense industry is often cited as an example of growing relations between Czech Republic and India. 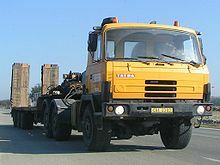 In 2010 the Indian Government ordered 788 vehicles from public sector defence equipment manufacturer Bharat Earth Movers. The order comprises supply of 498 8��8 vehicles, 278 6×6 vehicles without winch and 12 6×6 with winch. Reportedly following one of the Israeli-Arab conflicts, Israel tested some Tatras captured from the Egyptian armed forces. The Israel Defense Forces' command was apparently quite impressed with their performance, independent air cooling, and their capabilities as military trucks in long-range raiding operations in desert terrain, and became interested in including these trucks in their arsenal. 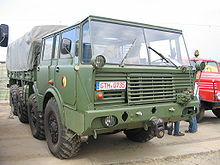 As direct purchase from Czechoslovakia was impossible due to its alignment with Israeli foes, the lore has it that Israelis used the well-paid services of Nicolae Ceauşescu-led Romania, in cooperation with an American Company called ATC (American Truck Company) to purchase military trucks, including desert-equipped Tatras, leading to jokes that "Romania has a new desert". Current photos of various Israeli weapon systems, including SPYDER slated for India, show new Tatras as the carrier vehicles. A number of Tatra trucks entered service in the Israeli Army's various sectors, with the brand mark of "American Truck Company", under which Tatras were sold from the U.S. market and exported to Israel. American Truck Company was a quasi-independent company set up by Terex, when they controlled Tatra, to import Tatra vehicles in both knock down kits or fully built and carry out assembly operations, repair and service, body building on chassis in the United States. These trucks were offered to the military and other government organizations and were badged and sold in the United States under the ATC brand. ATC badged Tatras were fitted with American Cummins turbodiesel engines in place of the Tatra's air-cooled diesel. 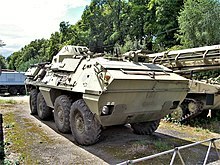 Tatrapan 6×6 Armored vehicle based on the Tatra 815 chassis. 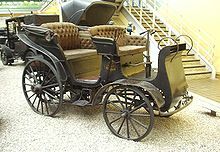 ^ See Peugeot first car built in 1889. ^ "About the Company". Tatratrucks. ^ Margolius, Ivan & Henry, John G. (2015). Tatra - The Legacy of Hans Ledwinka. Dorchester: Veloce Publishing. ISBN 978-1-845847-99-9. ^ "NW Präsident - Jak to všechno začalo". AutoZine.cz (in Czech). 1 March 2015. ^ a b c d Margolius, Ivan & Henry, John G. (1990). Tatra - The Legacy of Hans Ledwinka. Harrow: SAF. ISBN 0-946719-06-3. ^ "Cars & history: Tatra T77 & T77A (1933–1938)". Tatra. NL: Demon. Archived from the original on 2006-10-12. Retrieved 2018-08-21. ^ Bohumír Mimra, 'Vývojové směry moderního automobilismu', SIA 1936, Technická práce na Ostravsku 1926 – 1936, Moravská Ostrava 1936, p. 593. ^ "Brief History of Tatra". UKCAR. Retrieved 27 January 2011. ^ "1961 Corvair/Rear-engine cars". time.com. 2007-09-07. Retrieved 2008-06-10. ^ "Prague Post". Prague Post. Retrieved 26 December 2018. ^ UTC. "Tatra plans to renew production of its legendary models - 03-04-2008 14:24 UTC - Radio Prague". Radio.cz. Retrieved 2010-09-16. ^ "Tatra 903 Fuel Cell Concept - Carscoop". Carscoop.blogspot.com. 2008-07-01. Retrieved 2010-09-16. ^ "Tatra T87 four-door sedan". Retrieved 26 December 2018. ^ Prospector, Gold (2008-04-27). "Picture of replica first Tatra truck". Flickr.com. Retrieved 2010-09-16. ^ "Tatra 27 vehicle description. Retrieved 2008-11-29". Tatraportal.sk. Retrieved 2010-09-16. ^ "Tatra 92 technical specifications. Retrieved 2008-11-29". Tatraportal.sk. Retrieved 2010-09-16. ^ "Tatra 111 specifications. Retrieved 2008-11-29". Tatraportal.sk. Retrieved 2010-09-16. ^ "Tatra 815 description" (in Czech). Archived from the original on 2010-06-05. Retrieved 2008-11-29. ^ "TerrNo1 cabin" (in Czech). Archived from the original on 2010-06-05. Retrieved 2008-11-29. ^ "Tatra On Air the only aircooled Euro V engine in the world" (PDF). Archived from the original (PDF) on October 29, 2008. Retrieved 2008-11-29. ^ "Tatra Armax" (PDF). Archived from the original (PDF) on October 9, 2006. Retrieved 2008-11-29. ^ "Tatra Force" (PDF). Archived from the original (PDF) on October 9, 2006. Retrieved 2008-11-29. ^ "T816 history" (in Czech). Archived from the original on 2009-02-07. Retrieved 2008-11-29. ^ "Tatra military specials T816". Archived from the original on August 22, 2008. Retrieved 2008-11-29. ^ "Tatra military trucks". Archived from the original on August 22, 2008. Retrieved 2008-11-29. ^ "Tatra 817" (PDF). Archived from the original (PDF) on November 7, 2006. Retrieved 2008-11-29. ^ "Tatra 163 Jamal" (PDF). Archived from the original (PDF) on October 9, 2006. Retrieved 2008-11-19. ^ "Jiří Španihel". Retrieved 2008-11-29. ^ "Tatra T810". Retrieved 2008-11-29. ^ "Praga loses its court bid against Tatra". Archived from the original on 2009-02-15. Retrieved 2008-11-29. ^ "Navistar, Tatra unveil two tactical vehicles at Eurosatory". Archived from the original on 18 December 2010. Retrieved 27 June 2010. ^ "Navistar-Tatra-ATX8-8×8-truck-system". Retrieved 27 June 2010. ^ "Navistar Defense and Tatra's ATX6 at Eurosatory". Archived from the original on 16 September 2010. Retrieved 27 June 2010. ^ Terex sells its 80 percent share of Tatra. here  and Here . ^ "DAF Trucks grabs 19% stake in TATRA and supplies engines and cabs for new range! Biglorryblog has the story..." 2011-08-03. Archived from the original on 2011-08-28. Retrieved 2011-08-03. ^ "Slavná značka přežila. Vyléčit ji má i Tatraktor - Aktuálně.cz". Aktuálně.cz - Víte, co se právě děje. 29 November 2013. Retrieved 26 December 2018. ^ "Tatra loni zvýšila produkci o 56 procent, všechny vyrobené vozy prodala". Euro.cz (in Czech). 3 January 2017. ^ "České výrobce užitkových vozidel láká západní Evropa". E15.cz (in Czech). 20 November 2017. ^ "Introduction to Tatra Vectra Motors Limited". Tatraindia.com. Archived from the original on 2011-10-04. Retrieved 2011-01-24. ^ "MACHINIST". machinist.in. Retrieved 26 December 2018. ^ "SDC Announces Large Indian Order for its Tatra Truck Unit; Tatra Backlog Up Significantly Over Last Year. (09-MAY-02) Business Wire". Accessmylibrary.com. 2002-05-09. Retrieved 2009-05-07. ^ "The Czechs' Indian Gambit". Global Politician. 2003-01-06. Archived from the original on 2009-02-15. Retrieved 2009-05-07. 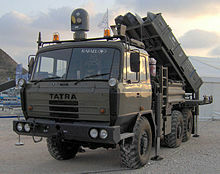 ^ "BEML wins Rs 632 crore order from Army for Tatra variants". NetIndian. 2010-03-19. Retrieved 2010-05-13. ^ DanieruShidebuteru. "Military Vehicles [Czech/USA]: ATC 6x6 14-Tonne Tactical Truck (Tatra/Terex)". Retrieved 26 December 2018 – via YouTube. ^ a b c "ATC 6x6 Heavy Utility Truck - Military-Today.com". www.military-today.com. Retrieved 26 December 2018. ^ a b c Murray, Alan (2000). World Trolleybus Encyclopaedia. Yateley, Hampshire, UK: Trolleybooks. pp. 99, 148. ISBN 0-904235-18-1. Margolius, Ivan & Henry, John G. (1990). Tatra - The Legacy of Hans Ledwinka. Harrow: SAF. ISBN 0-946719-06-3. Margolius, Ivan & Henry, John G. (2015). Tatra - The Legacy of Hans Ledwinka, new edition. Dorchester: Veloce Publishing. ISBN 978-1-845847-99-9. Wikimedia Commons has media related to Tatra.